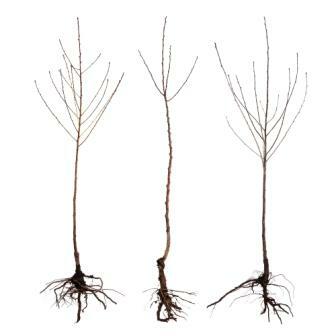 Plant bare-root trees and shrubs in winter and very early spring (from the end of October to early April in most parts of the country) when the plants are dormant and the ground isn't frozen solid. They'll have a chance to put out new roots before they have to cope with hot sun, drying winds and the added stress of producing leaves. Remove any packing material carefully, and rinse off or gently pull off any clumps of earth clinging to the roots; clip off any dead or damaged roots. Immerse the roots in a bucket of water to soak for at least one to four hours, but no longer than overnight. Supplying enough moisture is key to the success of bare-root planting. 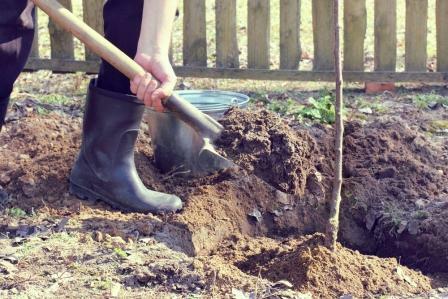 Dig a hole that's at least two feet wider than the root system and about as deep as the point where the roots flare from the trunk (or stems in the case of a shrub). Using your shovel, loosen the soil on the sides of the hole so it doesn't solidify around the plant's roots. Mound soil in the bottom of the hole so that the peak reaches just about ground level. 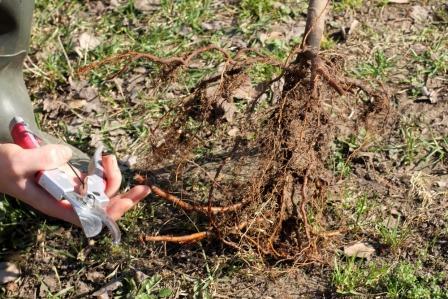 Place stakes in the hole if you're planting a tree that will need support (see below How to Stake and Tie a Tree). Set the tree or shrub on top of the mound so the roots cascade down over the sides. Spread them gently with your hands if you need to, and add or remove soil so that top of the root system is just at ground level. 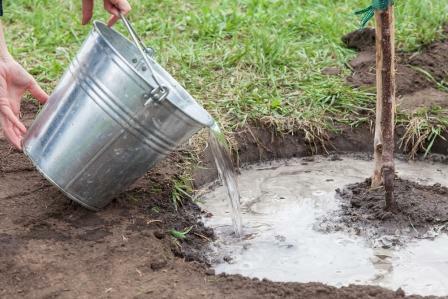 Fill the hole about halfway with soil and tamp it lightly with your foot to remove large air pockets. Make sure the tree or shrub is standing straight up, then water slowly to saturate the soil and remove any remaining air pockets. Finish filling the hole with soil. Use any extra to build a temporary berm above the perimiter of the roots and water again. Keep the soil moist for the first year after planting. Mulch to retain moisture, but keep at least six inches bare around the trunk. Check frequently; if you see yellow leaves or the soil feels dry, water immediately. 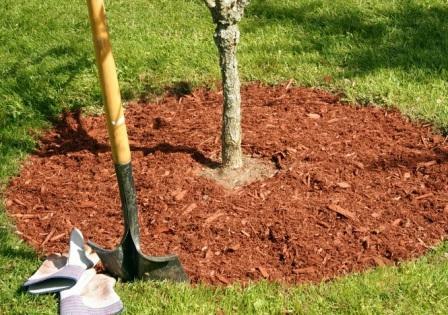 When mulching, make sure that you do not mulch immediately up to the trunk of the tree. Leave at least three inches around the tree mulch-free. Also, don't lay mulch on too thick. Two inches is more than enough to help conserve water. Just as you did with the soil, build a mulch retaining wall. After you're done planting, turn on a slow-drip hose. Water consistently, especially until the plant has had a chance to acclimate itself to its new home. It is much more effective and efficient to use a slow-drip hose for a longer period than a handheld hose for a few minutes. Buy wooden or metal stakes that are about 1/3 the height of your tree, plus at least 2 feet to be sunk into the ground. If your stakes are longer than 8 feet, 25 percent of the total length should be below ground. Drive the stakes into either side of the hole before you set in the tree. Secure the tree to the stakes with broad, soft straps or lengths of hose. Do not use wire, even if it's threaded inside pieces of hose; it can cut into the young trunk and cause permanent damage. Fasten the straps tightly to the stakes and very loosely to the tree. There should be enough slack so that the tree can move up to 2 inches in every direction. If the trunk can't move, it won't grow in girth and will remain unstable. Remove the stakes and ties within a year after planting.